The “bucking horse” appears on the plates of every vehicle licensed in the state of Wyoming, so you can’t have missed it. But have you ever wondered where it came from? Well, this long-lived and well-loved icon was the idea of Lester C. Hunt. Portrait of Lester Hunt. Taken from the front: “My compliments to my friend Joe. Lester Hunt, Secy State, 1940.” Photofile-Hunt, Lester C., Negative Number 17863, American Heritage Center. As Wyoming’s secretary of state, Hunt designed the state’s “bucking horse” automobile license plates. 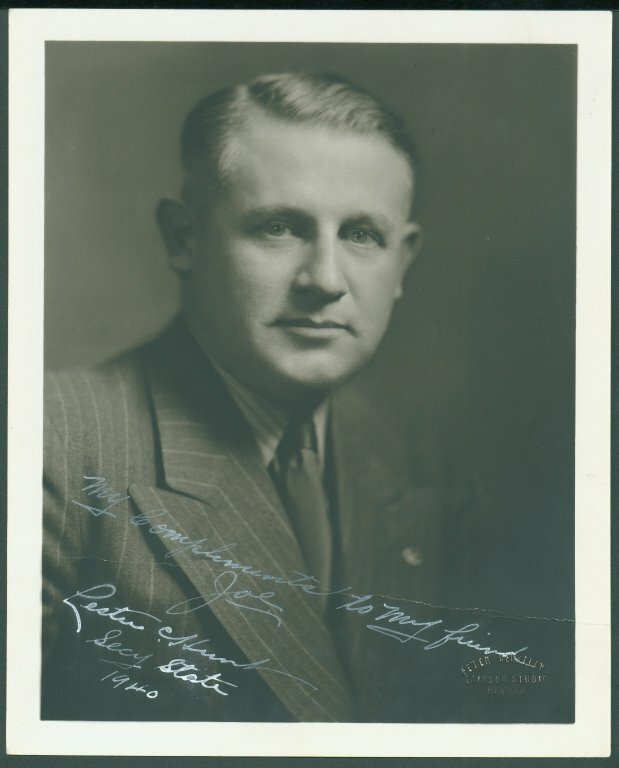 Mr. Hunt was Wyoming’s secretary of state from 1935-1943. Hunt was elected governor of Wyoming in 1942 and 1946, and U. S. senator in 1948, a position he held until his death in 1954. The AHC has recently completed a folder-level finding aid for the Lester C. Hunt papers (#270). Normally, the AHC describes boxes at a box level, meaning that the collection’s contents are described to the extent that the contents of each box are generally given. However, if a collection is deemed to have especially significant historical value or receives a high level of attention from scholars, it may be described to the point where the content of each folder is described, or even each item. Hunt’s papers are divided largely divided into sections. The first one details his career at Wyoming’s secretary of state and governor. In this part, researchers will find information about the designing of Wyoming’s license plates, the creation of the Jackson Hole National Monument, and Wyoming during and after World War II, among other topics. The second part of Hunt’s papers cover his time as a US Senator. These papers provide an exceptionally detailed view of the US government during the earlier part of the Cold War due to Hunt’s involvement with topics related to military and civilian preparedness for war. Other topics relevant to American society at the time, ranging from Alaskan statehood to organized crime and beyond, are documented as well. Hunt, who was a dentist until 1934, had a particular interest in dental care among the civilian population and in the military, as well as the topic of national health. Several speeches and pieces of legislation Hunt was responsible for address this topic. Several pieces of legislation related to topics in Wyoming, such as irrigation, mining and minerals, and conservation are detailed in Hunt’s Senate papers as well. Lester C. Hunt with the committee on the North Platte Project. 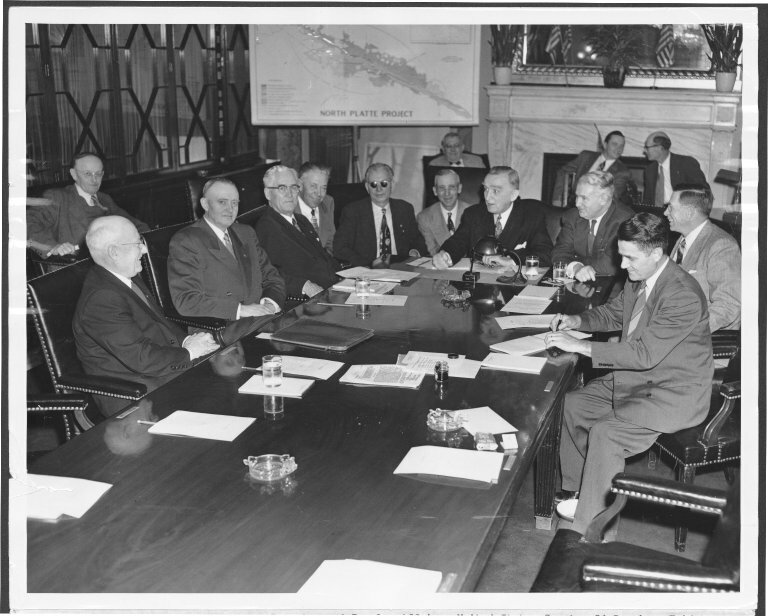 Taken from the caption: Hearing before Committee on Interior and Insular Affairs, United States Senate, second session, Friday, April 25, 1952, on S 2720, Amendatory Repayment Contracts, North Platte Project. I. J. Matthews papers, Box 1, American Heritage Center. The Hunt papers provide a wealth of information about American and Wyoming history. They, along with the Francis E. Warren papers, the Joseph O’ Mahoney papers, the Craig L. Thomas papers, and the several other political collections the AHC houses provide invaluable tools for researchers interested in learning more about Wyoming and the United States from the 19thcentury to present day. This entry was posted in newly processed collections, Politics, Wyoming history. Bookmark the permalink.